SURREY, BC--(Marketwired - November 22, 2016) - The 28th annual ASTTBC Technology Awards and Recognition Celebration creates the opportunity to recognize BC's Technology Professionals who have demonstrated outstanding achievements. Mazza Innovation, the recipient of the ASTTBC TechGREEN award, is one of nine industry leaders recognized at the Vancouver Marriott Pinnacle Downtown hotel on November 19, 2016. Mazza Innovation, of Delta, BC, specializes in extracting bioactive compounds for natural foods, supplements and beauty products. Bioactive compounds are a type of chemical found in plants and certain foods that have actions in the body to promote good health. Dr. Joe Mazza is a world-renowned food scientist sought worldwide for his expertise in plant-based nutrition. Dr. Mazza has published more than 200 research articles, and five books. He was named by the Institute for Scientific Information (ISI) as one of the world's most cited and influential researchers in Agricultural Sciences in 2004 and 2014. While his legacy in food science is firmly established, it is the more recent technology he developed as a Principal Food and Bioscience Research Scientist at Agriculture and Agri-Food Canada that will have the most far-reaching social consequences. Dr. Mazza and his colleagues are considered to be innovators in high-value plant bioactive extraction. They have pioneered the PhtyoClean Method, a water-based extraction process that purifies and concentrates bioactives. This extraction process provides better yields and purities than industrial solvents. The PhytoClean™ Method -- the earth-friendly way to extract bioactives from plants using only water -- produces clean ingredients. Mazza Innovation specializes in extracting bioactive compounds including polyphenols, alkaloids, glycosides, and specialty carbohydrates -- ideal ingredients for functional foods, dietary supplements, and beauty products. The 2016 ASTTBC TechGREEN Award was presented to Dr. Joe Mazza, Founder and Ben Lightburn, President of Mazza Innovation by Kathy Kinloch, President, BCIT and Wayne Hand, Dean of the BCIT School of Construction and the Environment. BCIT is the presenting partner of the ASTTBC TechGREEN Award. "ASTTBC recognizes organizations that take a lead role in sustainable best practices, energy conservation, and environmental benefit," said John Leech, CEO, ASTTBC. "Mazza Innovation is at the forefront of natural health product research and they hold environmental sustainability as one of their core values." 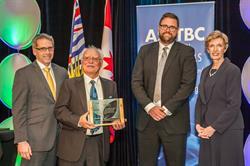 "We are honored to receive the ASTTBC TechGREEN Award. It is Mazza Innovation's vision to produce the cleanest, greenest ingredients that benefit our health while preserving a healthy planet. Our commitment to environmental integrity is driven by founder Dr. Joe Mazza and resonates through our team of very talented staff. We appreciate the recognition from our industry peers and our associates at ASTTBC." Established in 1958, the Applied Science Technologists & Technicians of British Columbia is the voice of Technology Professionals in the province. ASTTBC is focused on achieving professional recognition for technologists, technicians and technical specialists. The Association's mission…to serve the public by regulating and supporting Technology Professionals' commitment to a safe, healthy and sustainable society and environment. Our mission is to reflect health in everything we do -- from the ingredients we produce to the ways in which we give back to the planet. Simplicity is key to our method -- water and plants. People around the world can enjoy food, take supplements or use beauty products knowing that the ingredients are derived naturally and without organic solvents. At Mazza Innovation, we acknowledge the interconnectedness of our health and the health of the earth. We strive to promote environmental responsibility across our organization and around the world. The 2016 ASTTBC TechGREEN Award presentation. Left to right: Wayne Hand, Dean of the BCIT School of Construction and the Environment, Dr. Joe Mazza, Founder, Ben Lightburn, President of Mazza Innovation and Kathy Kinloch, President, BCIT.